Today was the first time I kayaked outside of New York. That's right. I tried some place other than Long Island. I put in my kayak at Calf Pasture Beach Park by Norwalk Islands in Norwalk, Connecticut. I joined my cousin and set out into the waters around 8:45am. A decent start with the water quite motionless. It was as if paddling in a pond only disturbed by the occasional frog. Plenty of sites to see but one worth noting is that of the Doe we spotted crossing from island to island. Yes, I know horses can swim and so can dogs but a Deer? It never crossed my mind. (See photo below.) The Deer is in the middle of the photo in the water. That's right...Just his head is above the surface. 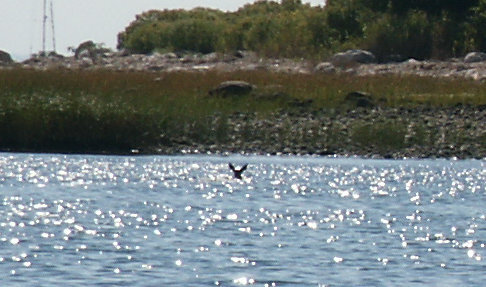 The deer had quite some speed going and it seemlessly galloped out of the water and out of sight into the island. I've been told that it is mating season so it is likely this deer is taking some extreme actions to find a mate. Later in the afternoon we started to prepare for some fishing. My cousin informs me that this area is known for some striped bass and Porgies to name a few. I brought my tackle box with me but I wanted to use live bait so we combed the shorelines for some bait. We found a few oysters, snails, and mussels and were about to set out to the kayaks when I accidentally kicked over a rock only to find a bunch of little crabs running around for shelter. They were small and fast. I quickly grabbed a few and set off to the kayak. As we began to fish, I decided to try crab. Primarily just to get it out of my kayak. I bait the hook and send the line on its way. Plunk. 1... 2... 3... 4... 14... 15... "bzzzzzz". My reel starts to spin and the pole bends to the water. Fifteen seconds and I catch a Porgy! Wow. Then my cousin too! They love crab that badly? Let me try again. I bait the hook and send it out again. Snap! Another one! But this one got away just as I got it to the surface. Proud of these catches, and hungry, we wanted to take this little guys home. We were not equipt with a bucket so I used a stringer to keep the two Porgy we caught alive for the rest of the trip. The stringer technique is new to me and it did the job. All in all. This day was awesome. Next time we are bringing a cooler, salt, pepper, olive oil, and a hibachi. If permitted of course!